Fuel is an item, along with food and water, that determines how far you can go and for how long you can be gone before having to resurface into the civilized world. With fuel, though, your options are limited, as you can hunt and fish for food and purify lake, stream, or mud hole water to quench your thirst. The recommended range for one fill-up when crossing Africa is 1000 kilometers or 620 miles, but this is general advice. “If you have any remote routes in mind, upgrading to a typical 1000km/620-mile range can give you peace of mind. 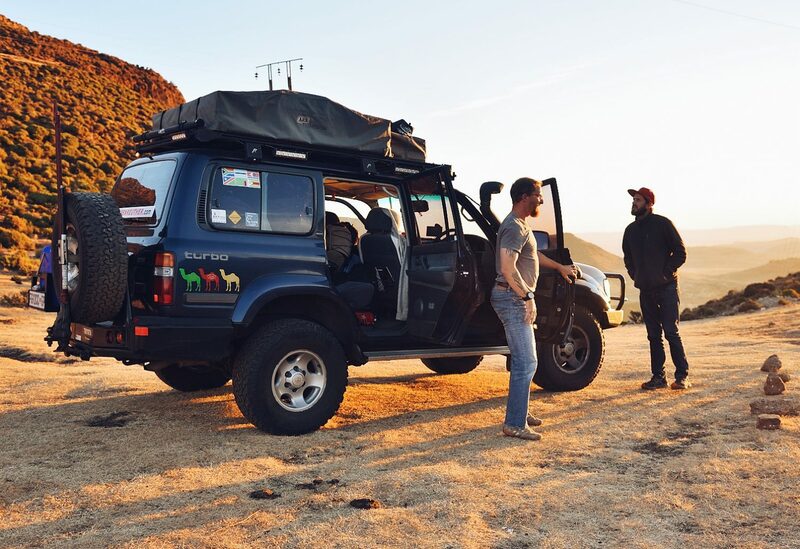 (Scott)” I found similar advice on the Land Cruiser Club Southern Africa site as well as stories to match. Rather than follow general advice I am finding it best to check the route and see distances between cities especially when crossing empty desert. For example, it is 964 km from Wadi Halfa, Sudan to Khartoum Sudan. If we have 1000km worth of fuel we basically cannot get off the improved surface as driving through sand and over other terrain can double your fuel consumption. Another example is the Central Kalahari; it is roughly 900km from Sevuti/Chobe back to South Africa and nearly all of that is on deep sand tracks. When Massi and I did the trip this distance, done with main, auxiliary, and three jerry cans depleted all of our fuel supply, and that was without getting stuck. Had we fouled up even one time it is possible that we wouldn’t have completed the trip. This is why I think that proper planning; carrying proper gear, and having proper training and ability are all necessary. I am heeding the 1000 km general rule, but will plus-up a bit so that if I want to get stuck I can. I have what Toyota calls an 85l tank that I have never been able to get more than 75l in. If there is another 10l in it, I have not been willing to drive it to empty though the needle has settled square on the E. Taubenreuther is adding a 166l auxiliary tank made by The Long Ranger company out of Australia. This tank is custom designed for the 80-series Land Cruisers and is fit into the undercarriage in the rear of the truck where the spare tire sits. For this application it is necessary to find a new home for the spare which will be moving to a carrier on the rear bumper. The positive aspects of this setup are that I can fill the truck with enough fuel to carry me well over 1000km, the added weight is low in the vehicle, and it is hidden so that I get less flack at borders where fuel prices rise sharply. The negative aspect of the setup is that nearly all of my fuel is in one container. Though I have a paraffin test kit and a water separating funnel/filter if I foul up and forget to use them then all of the fuel is contaminated and can’t be filtered like it could from a jerry can. The other problem, which I have ordered protection for, is puncture damage. This is where background and focus come together. If you need a spotter, use one. If you have to get out to see and pick your line, do it. Be aware of your vehicle clearance and watch where you put your tires. If one slips off a rock at the right moment, it or another rock could puncture the tank. Though it is stainless steel, set in higher than the differentials/axles and in the rear of the truck I still have to pay attention when driving over unimproved surfaces, especially rocks. I still plan to carry jerry cans and water cans, though. There are many benefits to having a stock of them. For one, fuel can be filled and filtered or decanted at a later time. Also, fuel in cans is easier to share than the fuel in an auxiliary fuel tank. This is my main reason for carrying them, as I want to be able to assist other adventurers and locals who may be stranded and need some fuel. Additionally, and empty fuel can is easier to carry than a truck is to push. While I don’t think it is wise in all situations to walk, you never know what you may have to do. I just like being prepared and having more than one option. As I mentioned above, I am carrying a paraffin test kit and a water separating fuel funnel/filter. I received many warnings concerning fuel distributed from Nigeria. “The two worst enemies IMHO will be diesel contaminated with water, and diesel mixed with paraffin. The first you can avoid by using a water trap funnel filter (such as the Racor range from turboformance) when filling up (or decanting from your jerry can) while the second is not so much of a problem and can be circumvented by putting some two stroke oil in your tank with the diesel. (Denkema)” The Nigerians add a considerable amount of paraffin to the fuel and sell it. While engines will run on it, the paraffin will eventually destroy the engine and will definitely shorten the life of fuel filters. The paraffin test kit was sold by United Diesel and is a density test. If the fuel does not meet European Standard EN590 diesel density specification the the black pellet in the jar floats to the surface indicating fuel mixing. The funnel I purchased from Woick in Germany. It is designed to trap water and other contaminants as the fuel is poured or pumped into the tank or other container. 1. Scott, Chris; 2011; “Overlanders’ Handbook: Worldwide Route and Planning Guide, Car, 4WD, Van, Truck; Trailblazer Publications, pg 212.